When I started learning marquetry in the early 1990s, we were required to make our own piercing saw blades. We could have bought them but school rules were that we learn the old-fashioned way! Additionally, at the time, the commercial blades then available were considerably poorer than those manufactured today. Starting with a good-quality flat steel wire, we filed each individual tooth then took a punch to set one tooth one way, the next the other way before eventually sharpening and, where necessary, tempering the blade. After months of experience, and on a good day, each blade would take between 8 and 10 minutes. The result was an extremely good blade that rarely broke. However, the truth is that blades are very boring to make and doing so by hand is not the most commercially viable solution. So, while I industriously made my blades, I always kept my eyes open to the possibility of buying blades ready-made. There are many companies around the world that offer industrially made blades and those for metal, while varying in quality from one manufacturer to another, were generally good enough. However, finding a manufacturer who made blades good enough for wood was a greater challenge and it took me years to find a manufacturer who would make exactly what I wanted. I subsequently tried and tested many different sizes, settings and teeth per cm (or inch) and the fruit of this research is finally available for sale. 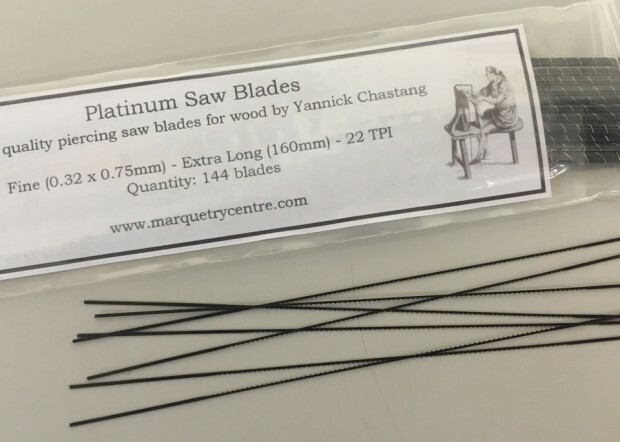 Yannick Chastang now offers for sale blades for wood marquetry that are specially made to our specification. We are confident that you will not find better blades on the market. I use them on hard and exotic timbers, on a daily basis, with no problems. They will of course eventually get blunt and will break if too much pressure is applied on them – the inevitable result of using a very fine (0.32mm x 0.75mm) blade. We offer different sizes and the finer they get, the more fragile they will be. Great marquetry cannot be cut with large blades; our biggest blades are suitable for beginners and thick wood, our finest are aimed at the experienced cutter or anyone prepared to push himself to his patience limit! With a little practice you will quickly learn how to use them and how far you can push them. Today, I break very few blades when cutting marquetry even on the hardest woods. We can also supply top quality blades for cutting metal. 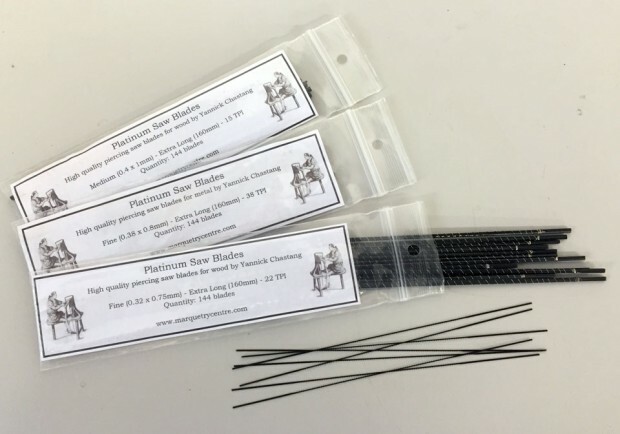 These are ideal for Boulle marquetry and work perfectly on brass, copper, pewter and even hard nickel silver with no problems. Most of my Boulle marquetry packets are made of two thin plywood counter veneers, saw cut ebony veneer (1mm thick) and 0.8mm brass sheets. I have no problems cutting everything at the same time (aided, I feel, by including greased paper in the sandwich to lubricate the blade during cutting, one of the numerous tips offered in my Marquetry Course). All the blades are extra long to accommodate the marquetry donkey. They can also be fitted to hand piercing saws and, if too long, can easily be cut using a hand cable cutter.